Make the move to protect the ones you love. Build an Estate Plan for peace of mind knowing that your loved ones are protected. Put a team to work for you that will orchestrate the best estate plan that can ensure your continued success. 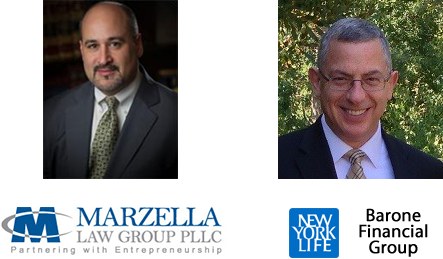 The Marzella Law Group PLLC and Barone Financial Group will create a synergy of your estate and financial strategy, charting a course through uncertainty. Schedule an Appointment for a Complimentary Analysis of your Estate Plan. If you don't have a plan yet, we can help you develop one. Fill out the form below and we'll get back to you right away. For immediate assistance, call (919) 653-8800 (Menu Option #3).